I like docks and have done for quite some time. I use the Mac OS X dock which I believe was the one that originated the concept. 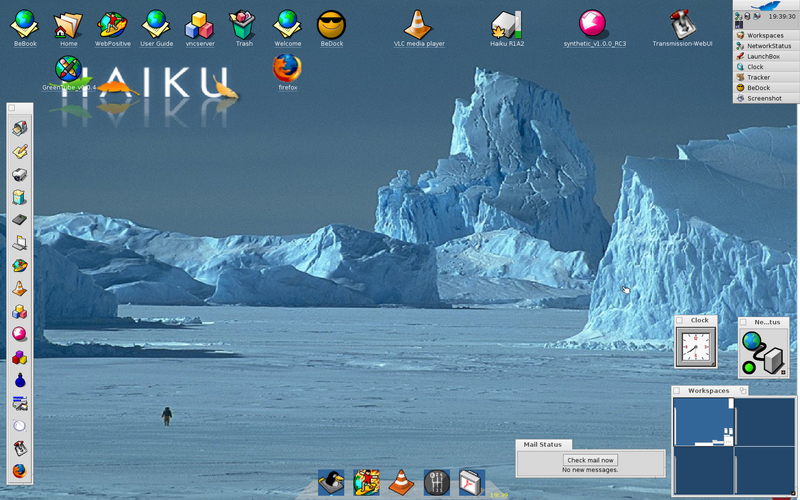 In Linux I use AWN although I've also used Kiba-Dock which works well in some distros. However, it hasn't been in active development for some years now. In Windows 7, Vista and XP I use the Winstep Nexus Dock which works very well. In Haiku up to now I'm using the LaunchBox which also works very well but perhaps doesn't quite have the eye-candy status of the docks in the more established OSes. Then I came across BeDock in the Synthetic Package Manager and installed it. 1. It really doesn't look great (see screenshot and note that I'm keeping LaunchBox at the ready in vertical layout as I'm probably going to take out BeDock after this post). 2. You can't drag and drop icons to the dock as with any of the others that I use or have ever used. Instead, you have to right-click on the dock, Configure Settings and drag not just the command to launch the app but also its icon. And, as far as I can tell, only .png icons are accepted while Haiku deals primarily in HVIF and SVG icons. 3. Because of the need to use only .png icons, it turnes out to be quite difficult to track down a suitable icon for many apps. 4.BeDock causes the OS shutdown/reboot to abort which means having to try shutdown a second time.